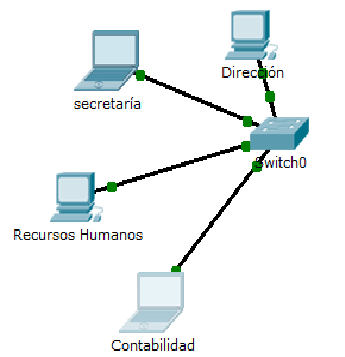 The most spread networks in organizations are LAN (Local area networks). A Local Area Network is limited to a small area, usually a building or a campus of maximum 200m. Nowadays, most L.A.N. 's are Ethernet networks. These networks are characterized by using twisted pair and fiber optic cable as transmission media. Networks using Ethernet divide a stream of data into shorter pieces called frames. Each frame contains source and destination addresses and error-checking data so that damaged frames can be detected, discarded and re-transmitted. The Ethernet standards encompass several wiring and signaling variants. The original Ethernet used a coaxial cable similar to those of TV as a shared medium. Later the coaxial cables were replaced with twisted pair and fiber optic links in conjunction with hubs or switches. The network of a small business. 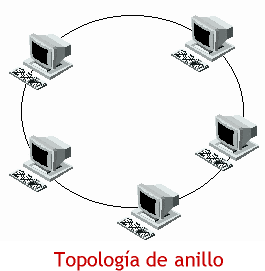 A metropolitan area network (MAN) is a network that interconnects users with computer resources in a geographic area or region larger than that covered by local area network (LAN) but smaller than the one covered by a wide area network (WAN). 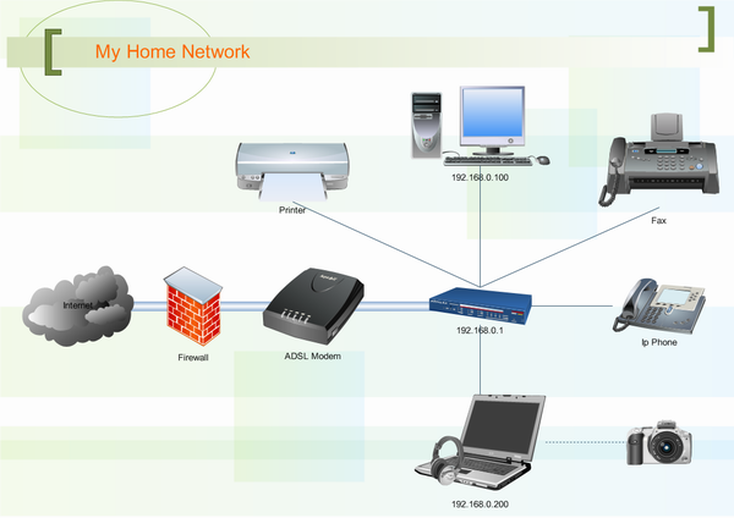 A home network or home area network (HAN) is a type of local area network with the purpose to facilitate communication among digital devices in a home. The importance of this networks are steadily rising, due to the spread of digital household devices able to connect to Internet. Later you will find out why this classification is so important in order to achieve a feasible network simulation. A Network card is a device that connects a computer to a computer network, usually a LAN. The Network card is also called a network adapter or NIC (Network Interface Card). There are different types of adapters depending on the type of wire used, (fiber optic, twisted pair), or the architecture used in the network (Ethernet, Fast Ethernet, Gigabit Ethernet, serial interfaces), but currently the most common is the FastEthernet using an RJ-45 connector and twisted pair cable. ACTIVITY 2. RESEARCH WHAT'S YOUR COMPUTER MAC. This cable is made up of a variable number of copper wire pairs that are entangled each other to reduce the electromagnetic noise (interference). This type of cable is used massively in most local area networks. The Ethernet lan's uses a four twisted pair cable ended in an RJ45 connector like the one shown int the bottom figure. In Shielded Twisted pair cables (STP) there is a sheet of foil covering the twisted wire pairs to enhance their protection from external interference. This allows increased performance at the cost of a higher price. For this reason this cables are only used in special purposes. The Unshielded variant (known as UTP cable) is the conventional cable found in a typical LAN. Twisted pair cable can also be classified in categories (CAT-1, CAT-2.. and so on) by its quality level. The most widespread cable in today's networks are STP and UTP Category 5 (CAT 5) cable for both Fastethernet (100mb/s) and Gigabit networks (1000mb/s). Category 6 and 7 ( CAT 6 and CAT 7) cables are improved versions of higher quality and price use for special purposes. When you click on the PC's end Devices category, different types of computers will appear, as shown below. 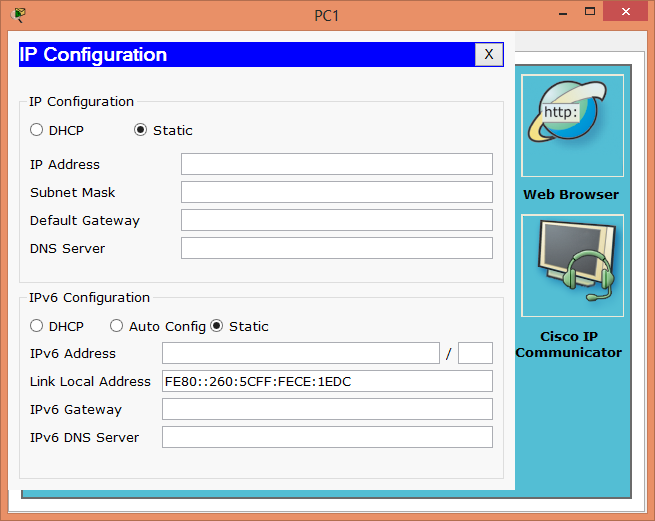 Select the first type (the Laptop generic PC) and drag it to the center of the Packet Tracer window. In this way, we will have set the first PC of our network. Select the direct twisted pair cable. (Cooper Straight). It is the black wire highlighted with a black circle in the image above. 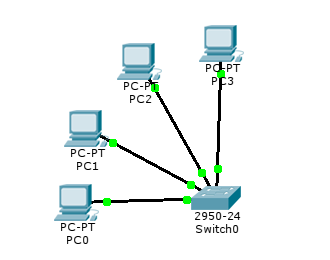 Let's connect the two PCs using a direct twisted pair cable: Click on one of the PC's, to deploy its network interfaces list, and choose the only ethernet port (FastEthernet0/0) available. Do the same on the other PC. ACTIVITY 4. What's the cause of the problem set forth in the previous paragraph. Consider the following hypothesis and discuss about them. You must come up with a list of points supporting or discarding them. If you can not figure out the right answer, go ahead with the next activity, and come back to solve this later. c) We are using crossover cable. We should use a straight cable due to the devices level. 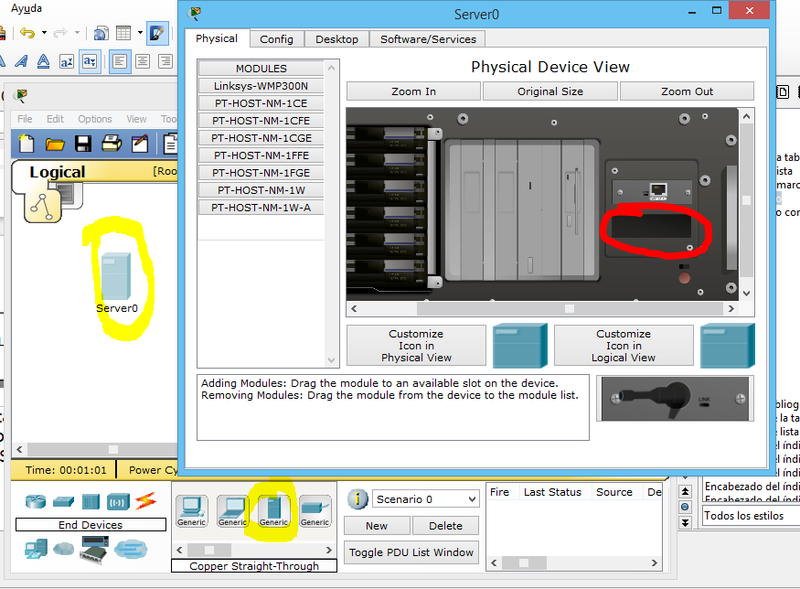 Select the category connections in the device classes (lower left).It is the Z-shaped icon highlighted with a blue circle. Select the twisted-pair crossover cable. (Cooper Cross over). It is the discontinued black wire highlighted with a green circle. 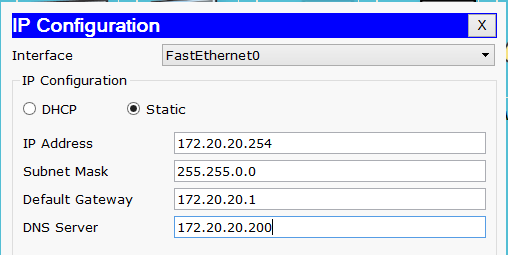 In the left column select the network interface FastEthernet0. The configuration network interface window will open. The network interface is active and the Mac appears in the MAC Address section. In the case of the image shown above, it is the 0030.A3AA.570C MAC address. In optical fiber cables data are transmitted by light pulses. Optic fiber has a much greater performance than twisted pair. The optical fiber can be used to cover large distances. ACTIVITY 6. Connecting two PCS through an optical fiber cable. 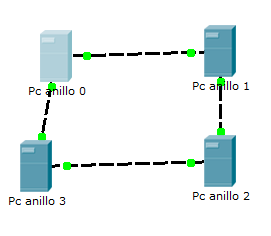 In this activity we will do the same we did in the previous session, but connecting the PCs with another type of cable: optical fiber. The computers now have a FastEthernet network card, which means they use twisted pair cable. So the first thing we have to do is to replace the network card by an optical fiber card. Remember that we are going to change the PC's network card, which by default is a twisted pair cable card, for a fiber optic card. To change a network card first we have to shut down the computer. Click on the power button to turn it off. Now look at the bottom of the PC. It shows a twisted pair RJ-45 socket. This is the network card that we are going to change. Repeat the same steps in the other PC, installing on it another optical fiber PT-HOST-NM-1FFE card. If you've done everything right the red dot on both sides of the connection will turn green meaning that the two PCs are properly connected . Two PC's connected by a cable are not a computer network. What if we want to connect 10 computers instead of just 2? Do we need to install 10 Network cards in any PC in order to get them interconnected?? Obviously, that's not a good solution. 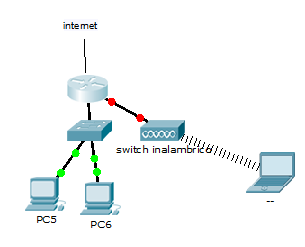 To connect multiple computers to the same network we must use a type of device called a SWITCH. 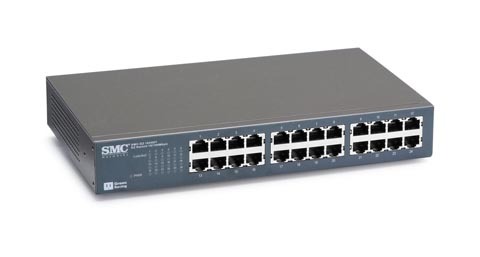 A switch is a device with several integrated Ethernet ports, that allows the connection of multiple devices. 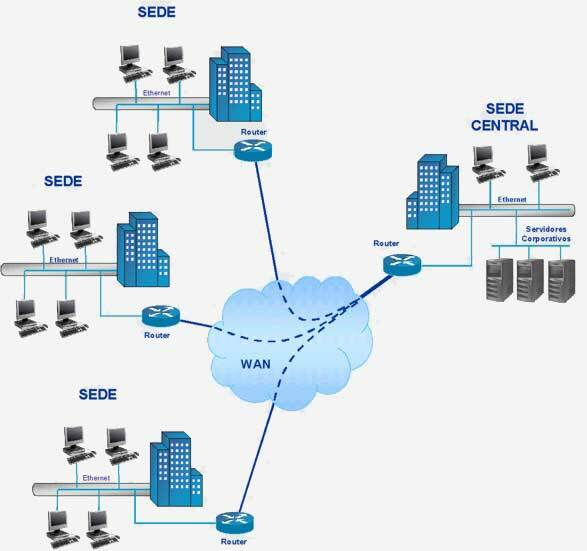 The switch provides other services as signal regeneration, some security issues and specially, it offers tools for centralized management of the network. In the following picture, you can see the Generic Server highlighted with a yellow circle. If you click on the server, the configuration window will open. Select the physical tab. There is a free slot for a second network card (marked in the picture with a red circle). Building a computer network is not as simple as to wire several computers. When a data packet is transmitted, it must be clear for all the participants who is the sender, and who must be the receiver. In the telephone network this problem is solved by the use of telephone numbers: when a call is made ​​the receiver's phone number must be dialed. In computers the solutions follow a similar but more complex pattern called routing. ACTIVITY 9. Answer in Moodle the Research and discuss switch the question labeled as activity 9. Pay attention to the following statement because it is very important. 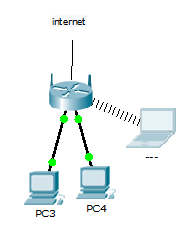 In an IP network, two computers can only communicate with each other, if they have the same network address. Activity 11 Designing Ip addresses for a 8 hosts network. Click on PC1. Its properties window will open. Notice that what we have done is to set up two different networks. Click on PC1. Its properties window will deploy. Write ping 192.168.30.5 and press enter. 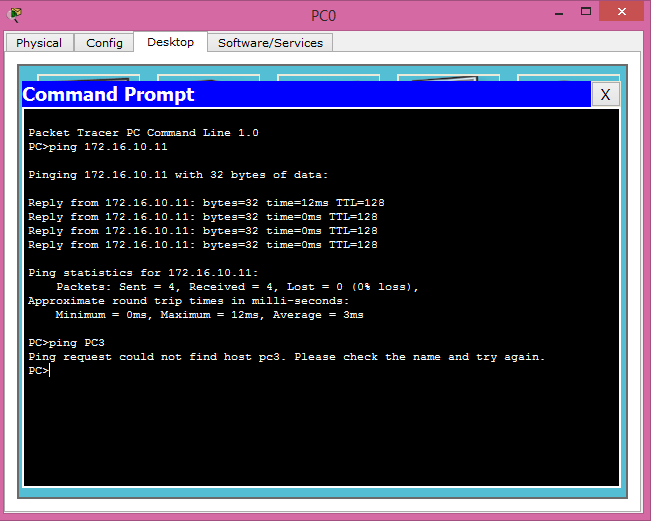 As you can see when PC1 pings to a computer that is located in a different network address, there is no answer. All the frames are lost. So far, we have learned that it is not possible to connect two computers that are not configured with an IP address belonging to the same network address. However this does not match at all with our everyday experience. When we connect to the internet, we are able to connect with millions of computers each of which is in a completely different network address. This is possible thanks to another kind of devices: the routers. In the network shown in the image there are two computer networks, both with the mask 255.255.255.0. 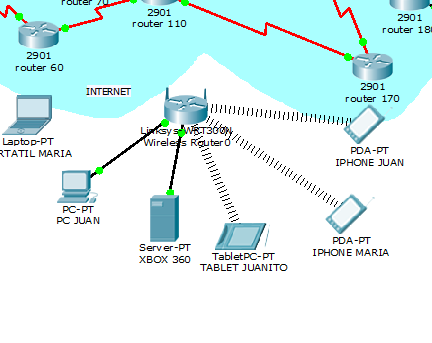 PCs from the top left network belong to the 192.168.200.0 network address, and the bottom right computers are on the 192.168.1.0 address network. Therefore they are not able to communicate each other. 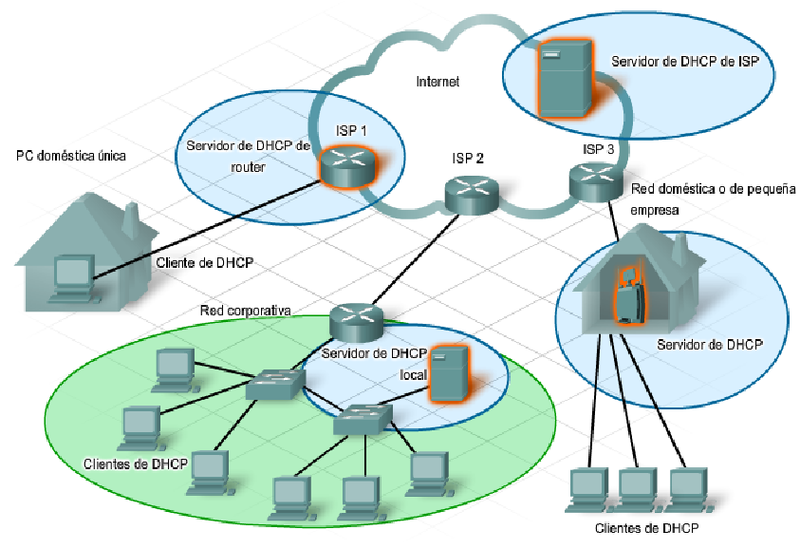 Therefore the computers in a network, in order to be able to communicate with other networks, must be configured with the IP address and network mask of the router interface connected to them. This interface is called a GATEWAY. ACTIVITY 12. 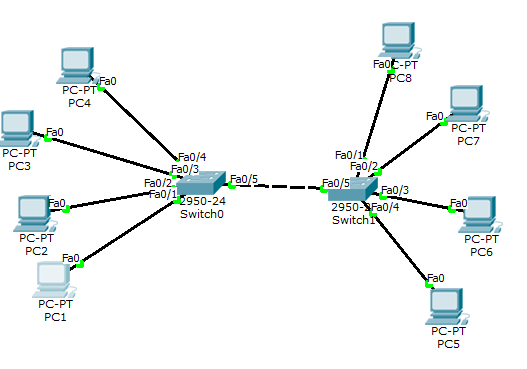 Using CISCO Packet Tracer design the network shown in the figure above. You are supposed to be able to do the following firsts steps. 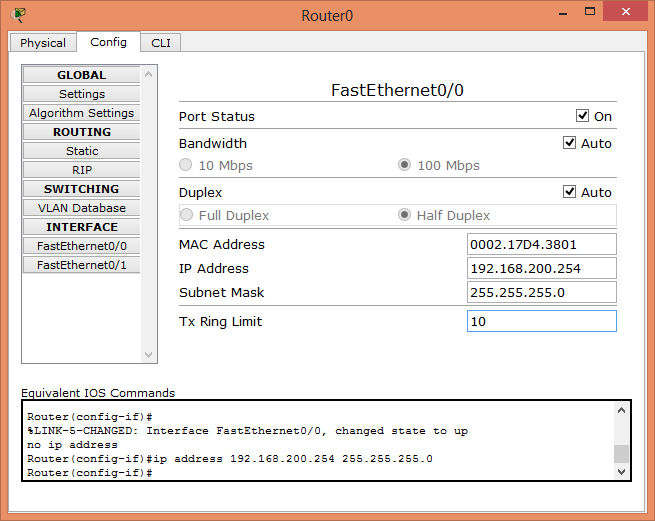 Select the other network interface (FastEthernet0 / 1). Put the address of the gateway in the Default Gateway box. We must test if it is working. If all goes right, we will be able to ping from H3 to H8 and receive a "pong". 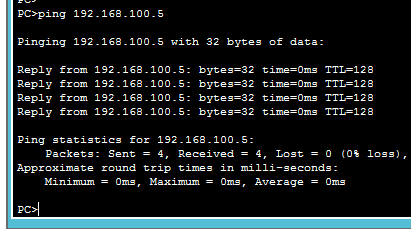 Call the teacher for help if the ping response shows "Request Time out 'or if the response is of type' Reply from 192.168.200.254 Host Unreachable"
We will perform the following network of 4 computers. Just drag the PC's and connect them without any additional settings. 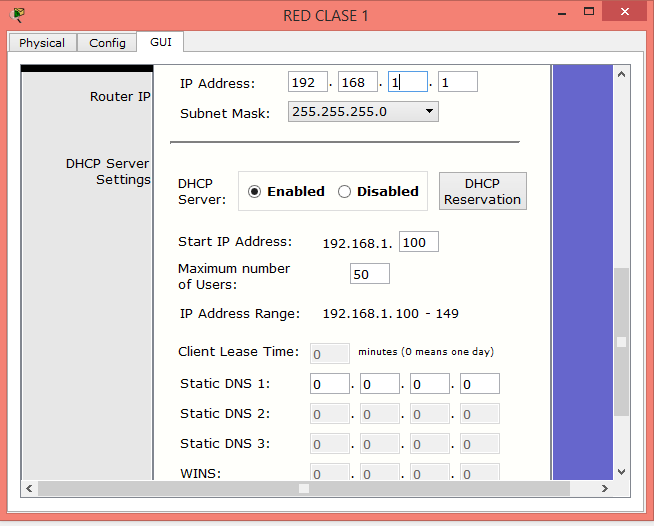 Now is the time to drop in the network a DHCP server. Select the bottom left class devices pannel in Packet Tracer. Select the category End devices and select a device type Generic Server. 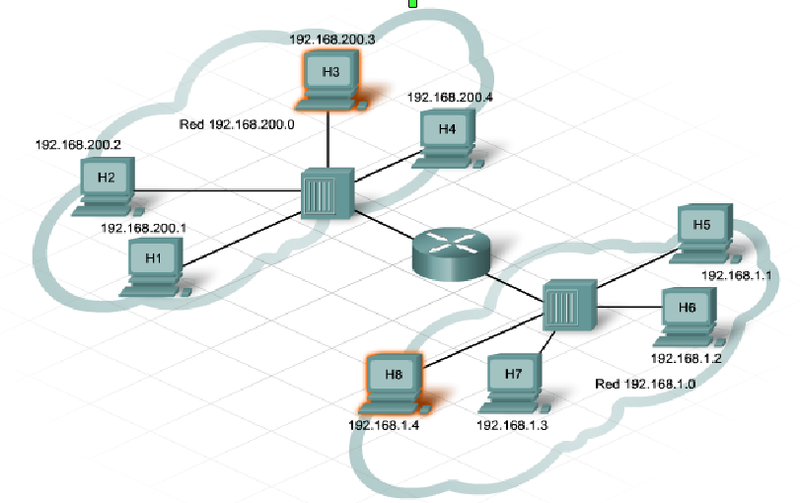 Drag the Generic Server to the main screen of Packet Tracer and connect it to the switch. 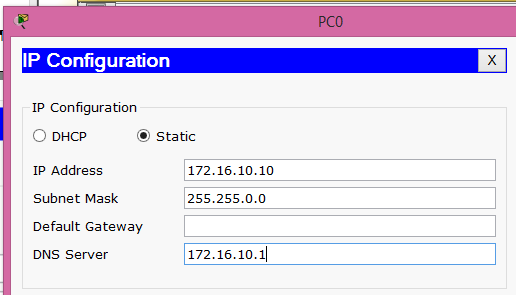 In this window we will set the IP configuration of the DHCP server. 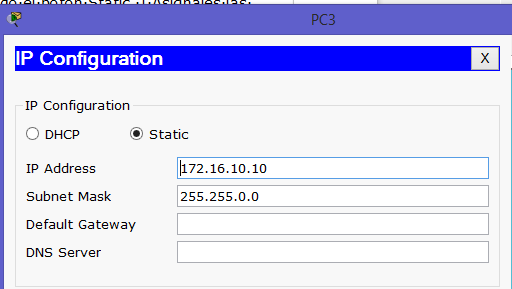 Start IP address indicates what will be the first IP address that the server can assign to a PC (and its mask). Put 172.20.20.2 This is important to understand, we started at the 2, because the 172.20.20.1 has already been assigned to the Default Gateway. Remember that the network can not have two devices with the same IP address. Maximum number of Users means the number of IP addresses to be assigned from the Start Ip address. If you enter 50 the server will grant up to 50 IP addresses starting with the 172.20.20.2, and continuing with the 172.20.20.3, 172.20.20 4 ... until 172.20.20.51. In this case you can put any number lower or equal to 198. Imagine you put 199, the last available address to grant would be the 172.20.20.200, and that is the one reserved to the DNS server. 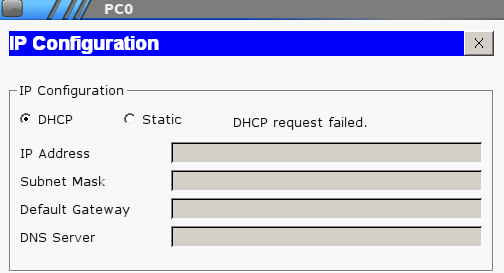 Let's try if our DHCP server is working. Domain Name System or DNS is a system for naming computers connected to the Internet or a private network . For most people it's difficult to memorize numbers as an IP addresses. Instead humans are good at memorizing words, so it is much easier for a human to remember something like www.amazon.com than its equivalent IP address. 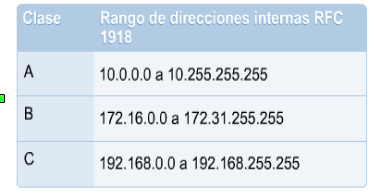 This is the reason why the DNS system was developed: to translate (resolve) names intelligible to humans to IP addresses with the purpose of locating and routing equipment worldwide on the Internet. Left to the primary domain, and separated by a dot, comes the domain name of the organization. This is the word used to identify that company on the Internet. Examples are amazon.com, ebay.com, elpais.es, hotmail.com. By the way, when accessing any website with a name that begins with www, for instance: www.elpais.es , we are connecting to a computer named www, which belongs to the specified domain, in this case elpais.es . Organizations always puts his web servers the name www, to make predictable for user the name of their web site. DNS root servers. There are only 13 Internet root servers. In the image above they are shown in the highest level (the balloon containing a point). The root servers only know the name and IP addresses of the top-level domains DNS servers (second row in the image above) as: com, org, net. es, fr, etc. 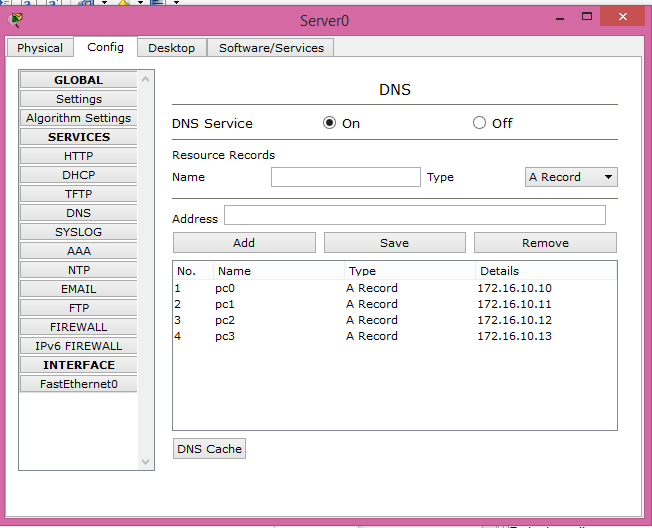 SECOND LEVEL DNS SERVERS: The second-level DNS servers know the names and IP addresses from a specific domain. For example there are one or more DNS servers in the second-level domain AMAZON.COM, who know the IP address of each of the computers that are in amazon.com. That is, the server is able to translate www.amazon.com or ftp.amazon.com , or smtp.amazon.com to IP addresses. 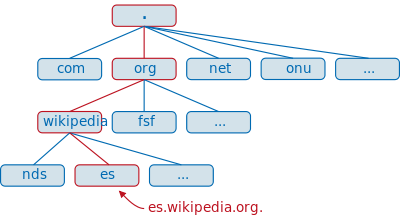 The local DNS server asks the orgDNS server which is the IP address of the DNS server in the wikipedia.org domain. The local DNS server asks the wikipedia.org DNS server which is the IP address of the computer called www. How many root servers are there? What do you think would happen if all them got down simultaneously? 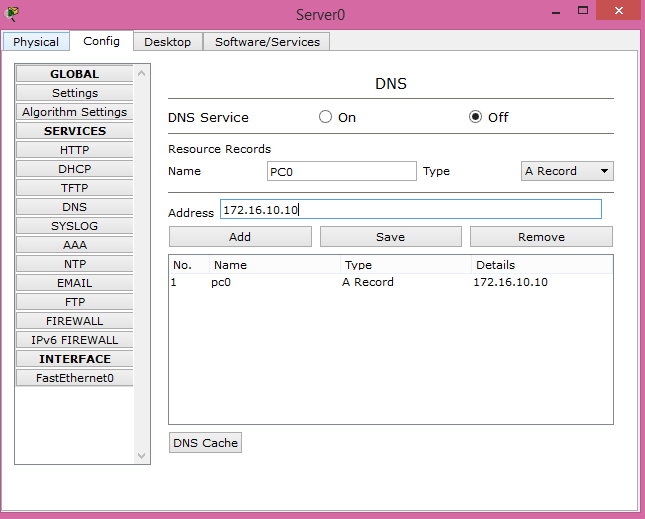 Where is the dns server for the .com primary domain? Enter the command ping 172.16.10.13 the command will report a successful connection. Now is the time to introduce a DNS server in your network. 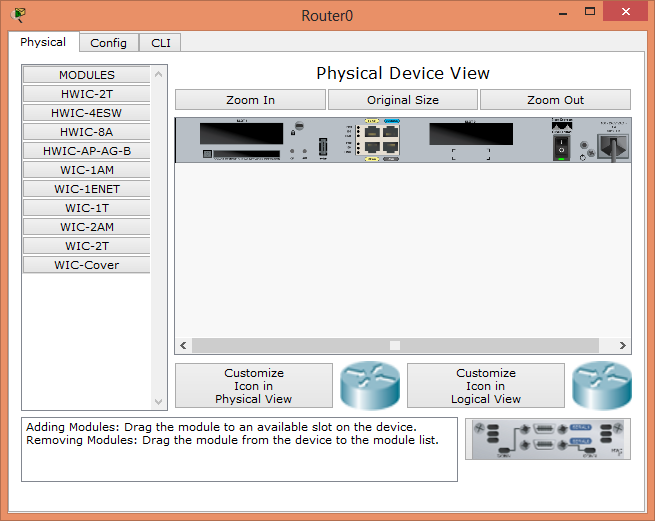 In the bottom left corner of Packet Tracer select the class devices pannel and choose the End devices category. Select the device Generic Server. The DNS server are now already running but the PCs on the network still don't know it. You must specify the IP address of the DNS server in the IP configuration in each computer on the network. When the IP protocol was developed, it was thought that 32 bits (four numbers from 0 to254) would be enough to assign an IP address to every computer in the world, because there were 4.294.967.296 of them. This number of IP addresses can seem enormous. But actually the world has nearly run out of them. There are several solutions to this problem: the main solution is the IPV6 protocol. IPv6 addresses are made of 128 bits (32 hexadecimal digits), which results in 2138 IPv6 addresses. This means a staggering 6.7 trillion IPV6 addresses per square millimeter on the planet. It is foreseeable that there wont be any scarcity of IPv6 address over a long period of time. But until IPv6 is fully introduced, the only way to save IP addresses is the world is the private and public system of IP's directions. A public IP address is a real IP address, which can be used on the Internet to access any computer connected to the global network. It would be equivalent to a mobile phone number. Private IP address are ranges of addresses restricted to local networks. Its equivalent in telephony would be the telephone extensions. In an organization with a local area network, computers use private IP addresses, and the only devices that have a public IP address are those on the edge of the network, that is the routers. This saves public IP addresses but has a drawback: the computers with private IP address can not access the Internet by themselves, and they need to be assisted by a router or other network devices with a valid public IP address. Using this trick we save many millions of public IP addresses. Before this system, an organization with 1000 computers needed 1000 public IP's. Now it only might need one Ip public address for its router. The other 999 computers would use private IP and when they would need to access the Internet, they will ask its router to do it for them. Private IP addresses can be reused again and again in computers belonging to differents LANs reducing drastically the number of public IP's the world needs. At home for example, even if you have multiple network enabled devices, only the router has a public IP address provided by your ISP. Other devices on your local network are private IP addresses assigned by your router. ACTIVITY 17. public IP addresses. In order to do this activity you need to log in our Moodle and download the file simulación_internet.pka. In this file a cloud of routers simulates how the Internet works. 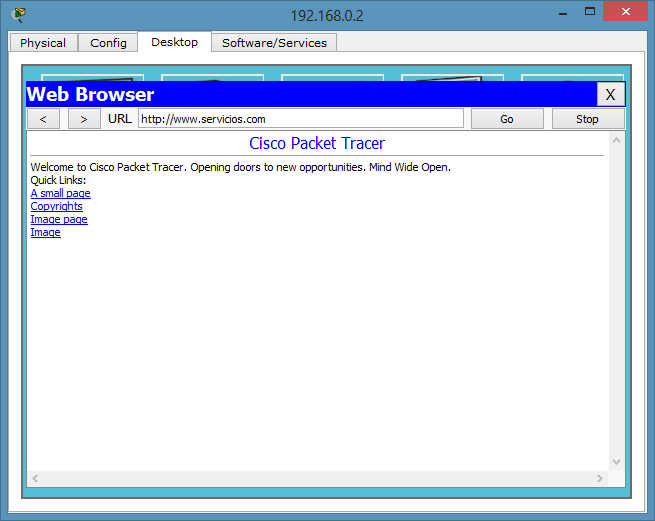 Open with Packet Tracer the file you have downloaded from Moodle. In this network internet is modeled as a cloud of routers. To connect a computer to the Internet just connect it to a router of the cloud. 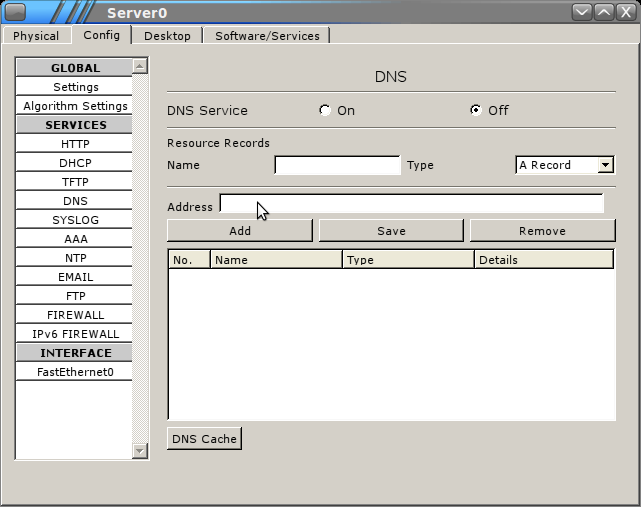 Two end devices simulate a DNS and Web server on the domain www.servicios.com. But the network actually works because the network address 192.168.0.0 is a private network address that does not apply outside the local network. It allows hosts to be identified within the same network, not outside it. ACTIVITY 18 local network for a school. In this activity we are going to build a local network for a school where there will be two classrooms equipped with 10 computers. 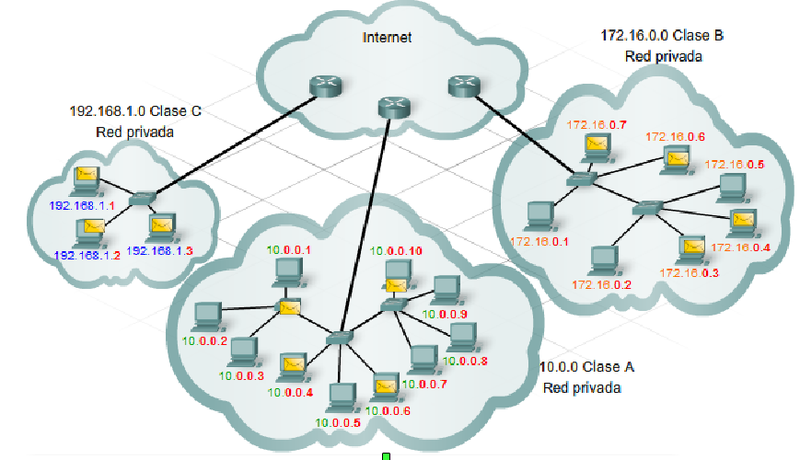 The classroom one should use the private network address of class C 192.168.0.0. Save the file and upload it to moodle. 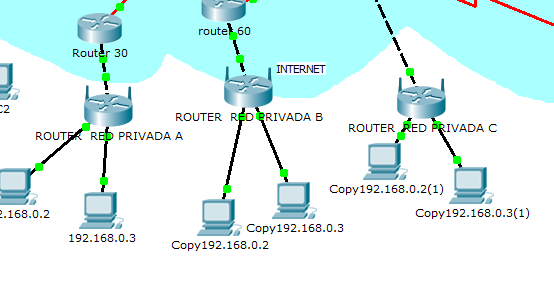 In the previous activity we have built a small local network with static IP addresses, that is, the network administrator (you) had to set up each computer IP individually. However, in a Linksys wireless router, we can enable the DHCP service so that the router could assign IP addresses dynamically. 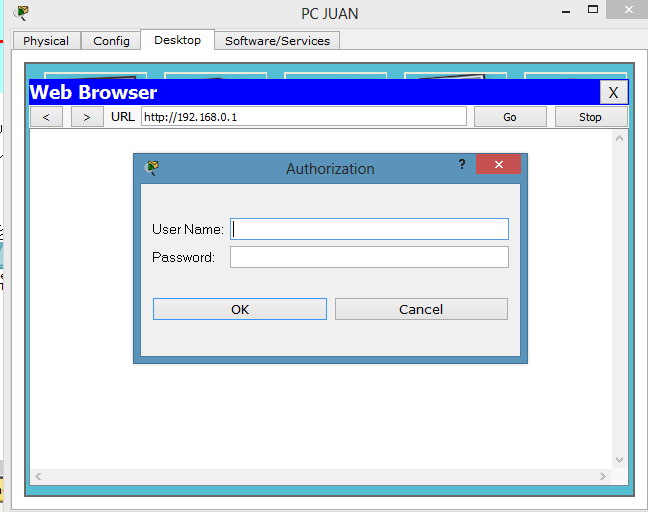 Open the file Simulación_internet.pka and save it as activity16. Connect a switch type 2950 to the Linksys router name Red Class 1 . Remember that these Linksys routers are designed for the domestic market, and are both a router and a switch (it has 5 Fastethernet ports). When connecting the switch 2950 use a twisted pair crossed cable, because we are connecting a switch with a switch, and are (two same level devices). The next step is to enable the DHCP service on the Linksys router. 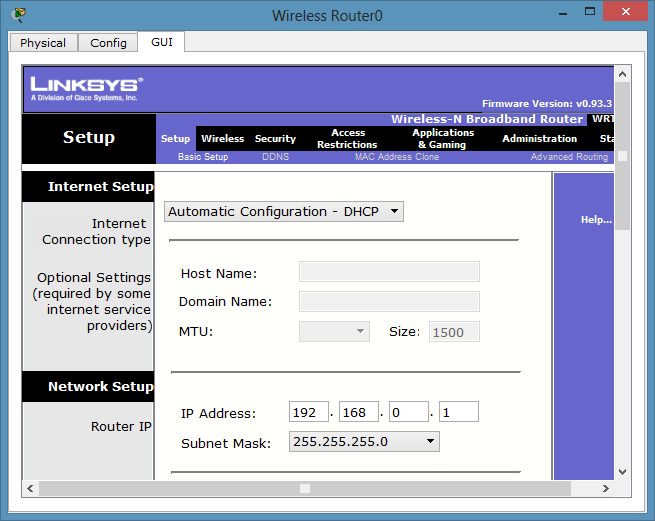 To do this click on the Linksys router, select the GUI tab, and scroll down the screen to the section network configuration. Put the IP address 192.168.1.1 . Don't forget to click the Save Settings button to save the changes. The need to limit the WIFI scope to a small range, in order to limit interference among WIFI LANs who are very close to each other. Domestic wireless communications have an effective range of 20m indoors and up to 100m outdoors. The range decreases with obstacles between transmitter and receiver. 20m indoors can be reduced to 8 or less if there is a wall in the middle. The need to split the channel into frequency bands, so that each user uses a channel portion. (Conventional radio stations do the same, each operates in a frequency band that does not interfere with the others). Need to protect the access point. The access point is an Internet gateway that can potentially be used by anyone with a wireless device nearby. It must be protected to prevent other users consume bandwidth while you're paying for it to your Internet provider. Wi-Fi: is a trademark of the Wi-Fi Alliance, this organization tests and certificates that the equipment meets the standards related to wireless local area networks. 802.11 : The 802.11 standards establish a series of requirements that must meet the network devices to be considered compatible. The standards IEEE 802.11b , IEEE 802.11g and IEEE 802.11n operates in the band of 2.4 GHz with a speed of up to 11 Mbit / s , 54 Mbit / s and 300 Mbit / s, respectively. Click on the router Linksys. It has 4 FastEthernet ports and a port labeled Internet. This device is not only a router but a combination of an Ethernet Switch Router + Wireless Switch + Server + NAT + DHCP server. Put all the wireless devices in a position near the router. You will see that immediately a wireless connection is established, shown as a discontinued line. Take away the current network card. Drag the portable module Fastethernet network to the dark rectangle in the bottom right of the screen. Now the card slot is empty. Select a Laptop- PT-1-NM-W module and drag it over the slot. This type of router is designed to provide a home user everything he could need to set up a home network. The router integrates a DHCP server to provide private IP addresses to each of the connected devices. 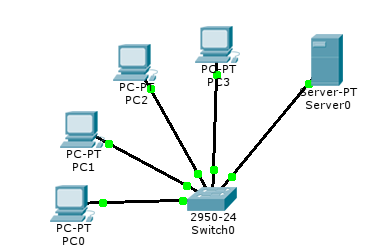 Just connect the computers to the router by wify or cable and it will get a full Ip configuration. Let's check connectivity by pinging between the PC of John, Mary, Iphone and Xbox. 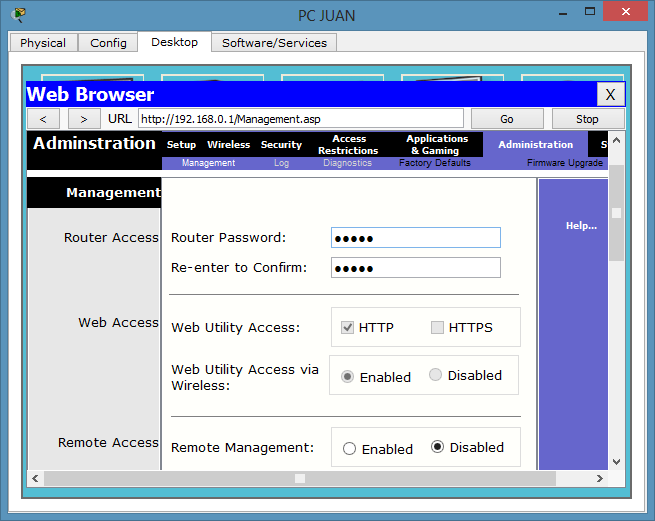 Click on the PC JUAN, select the Desktop tab, select IP configuration, and select the DHCP button. Immediately the machine should obtain an IP address from the router. Make ping between the three devices to test connectivity. Connecting the Linksys to the router 110. Remember that this device is equivalent to normal router, plus a wireless router, plus a wired switch. 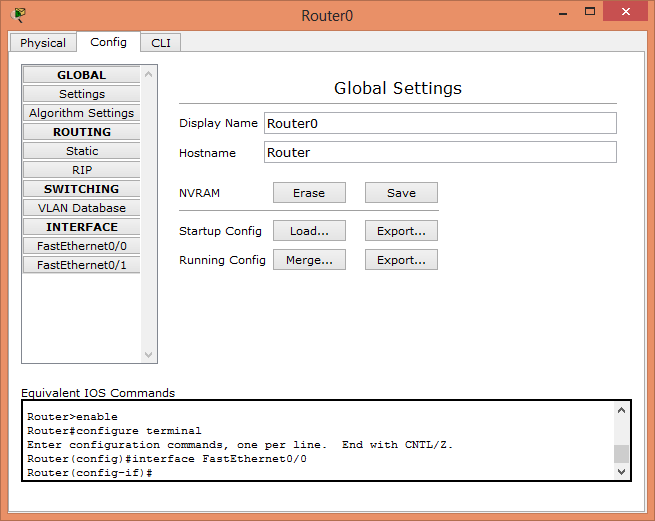 The local network devices are connected to the switch ports, and the router acts as a DHCP and NAT server for this devices. On the other hand, the router is the only device on the network that is actually connected to the Internet. In its Internet interface, the router must have a public ip (not a private one). This IP address is provided by the ISP (the service provider) through DHCP. In this way, the option shown in the picture is by default enabled. But in our simulation the router 160 is not a DHCP server and the IP address of the router Ethernet interface have to be set up manually. If all was right, the computers should be connected to the Internet. Let's check connectivity by pinging from some PC to the DNS root server. For instance, use Juan laptop for pinging 85.0.0.2. If you do not get a positive response asks the teacher for help.